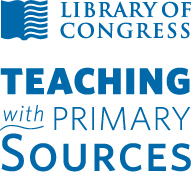 The Library of Congress's Teaching with Primary Sources (TPS) program works with an educational consortium of schools, universities, libraries, and foundations to help teachers use the Library¹s vast collection of digitized primary sources to enrich their classroom instruction. Teaching with Primary Sources builds on the success of the Library's previous outreach initiatives, particularly the American Memory Fellows and An Adventure of the American Mind programs, which reached more than 10,000 teachers. Professional development opportunities provided under the Teaching with Primary Sources program include workshops, seminars, graduate courses, distance learning courses, and mentoring to teachers of all disciplines. The Federation of Independent Illinois Colleges and Universities in conjunction with its partners has developed a Teaching with Primary Sources project to integrate primary source-based teaching and learning using Library of Congress digitized resources into pre-service and in-service teacher education. The Federation TPS Project has served as an ICSS conference sponsor for several years.